Feliway diffuser 48ml for cats. 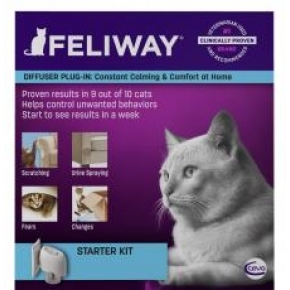 Feliway diffuser contains a copy of a synthetic pheromone that cats give off when they feel content. When your cat is content it deposits this pheromone on objects as it brushes its face across the object. 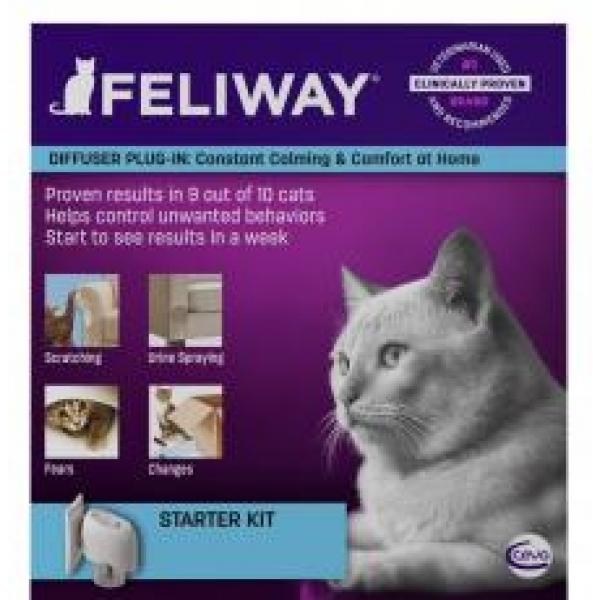 The feliway diffuser plugs into a normal electric socket and releases this pheromone into the area, covering an area of 50-70 square metres and lasting 4 weeks. When the pheromone is released into the area it helps reduce or prevent cat stress and the associated problems. Stress signs in a cat can be associated with the following, Urine spraying in the house, over grooming, conflict with other cats in the house. Medical problems associated with stress in cat are, cystitis, alopecia, anorexia, and obesity.